Restaurateur Seth Woods's flagship bistro has a refreshed interior, a new menu, and an outdoor patio on the way. 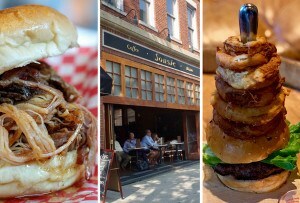 By Jacqueline Cain·	 7/11/2016, 1:09 p.m.
A longstanding French bistro is starting its 19th year in the South End with an overhauled interior design and menu. 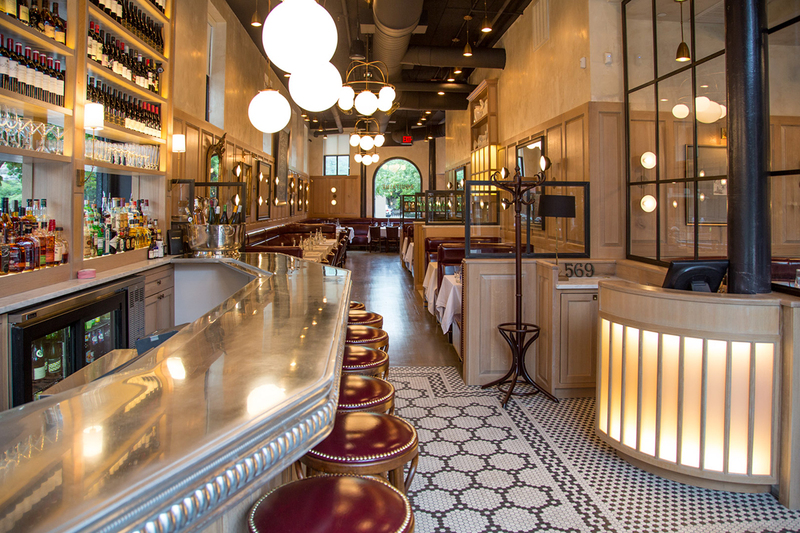 Aquitaine Bar à Vin Bistro reopens tomorrow after five months of renovations. 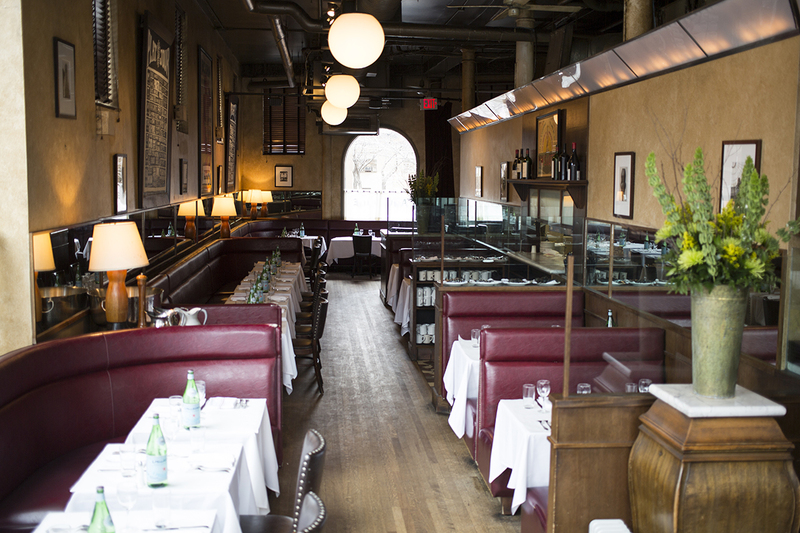 The flagship restaurant from owner Seth Woods’s group (Cinquecento, Metropolis), Aquitaine debuted on Tremont Street in 1998, one of the first arrivals to an area now considered one of Boston’s ultimate Restaurant Rows. 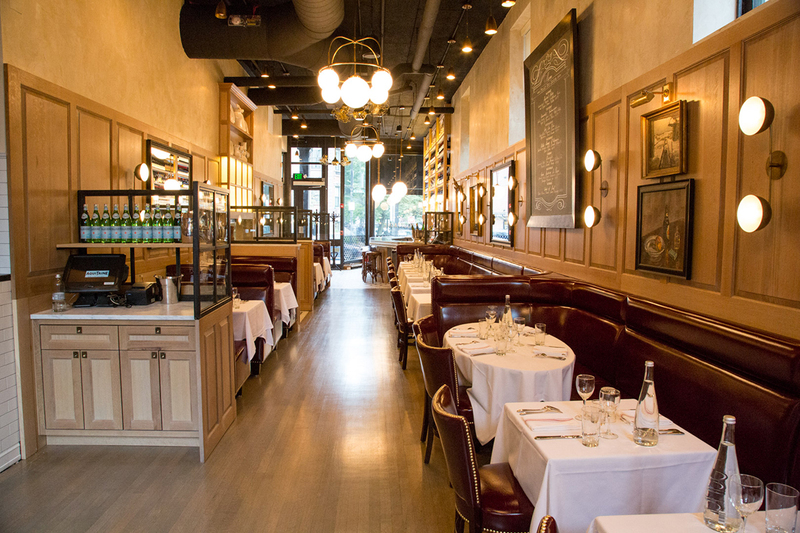 In the ensuing years, it has earned a reputation for solid French fare and an affordable wine list. 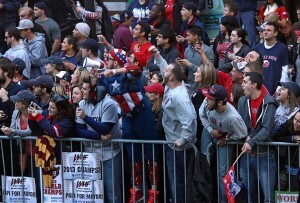 “It’s meant so much to me and other people that we wanted to make sure it stays true to what it was,” Woods says. Post-renovation, it’s still a Parisian-feeling, neighborhood restaurant, with a chef’s modern, personal interpretation of classic bistro fare. “When someone [visits Aquitaine looking for] Boston’s expression of a French bistro, I want them to go away feeling that we’re doing it right. 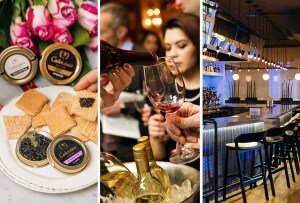 [Boston stands] tall with the rest of the country in regard to cuisine in all different areas, and we just want to do our part as the little French bistro that could,” Woods says. Located in the St. Cloud building, architect Nathaniel J. Bradlee’s 1869 homage to the French flat, the renovation by Hark+Osborne Interior Design centered on retaining that charm, while bringing the historic space into the 21st century. New windows, insulation, and heating and cooling systems aren’t glamorous updates, but they are things Aquitaine guests will benefit from, Woods says. The kitchen has all new equipment, too, and there’s now an additional restroom. The dining room has all new red, vinyl banquettes and other furniture, redone floors, more modern globe lights, and French oak paneling on the walls. Immediately beyond the entrance on the right, new glass panels separate an area of the dining room that can now be cordoned off for 20-person private events, a new feature at Aquitaine. “Because it’s glass, it doesn’t destroy the flow of energy in the room” when there’s a private event, Woods says. Another goal of the renovation was to expand the bar area. “It’s a cocktail bar, but a lot of neighborhood people come have dinner and socialize,” Woods says. 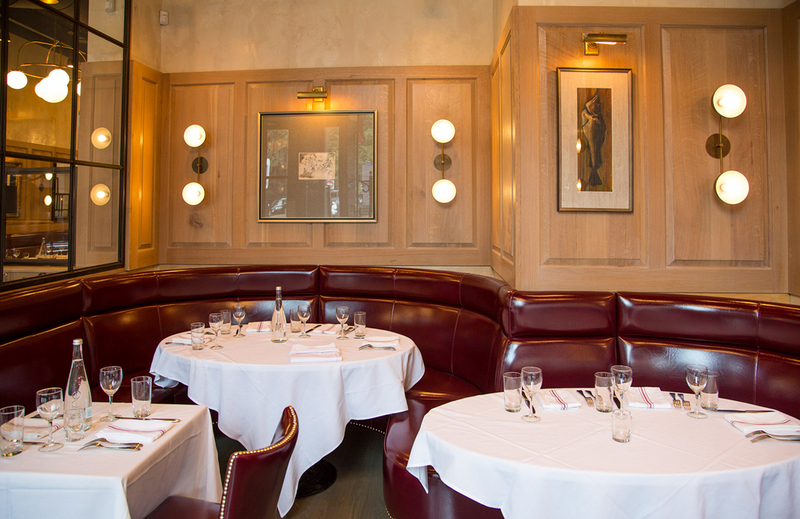 Now, they will sit at a new, 10-seat, zinc-topped bar, also paneled with French oak. 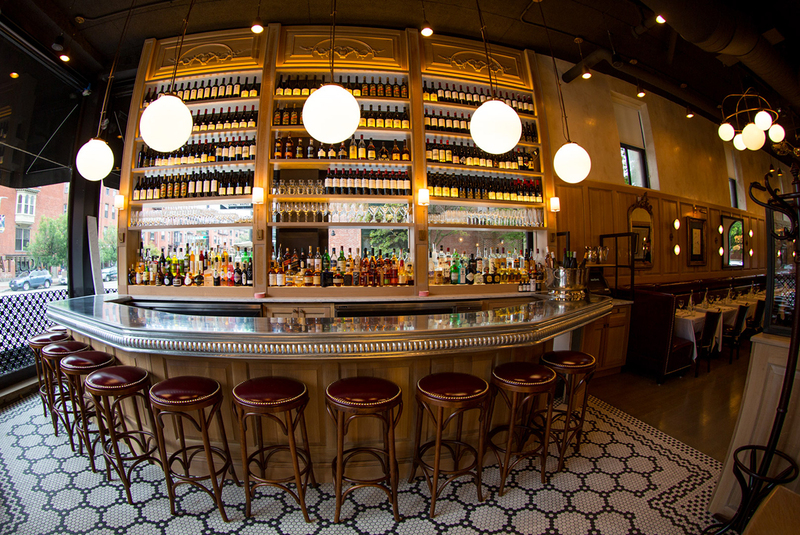 The bar area, reconfigured to open up the space, has new, Parisian hex-tile flooring. Outside, Woods’s team installed retro-looking French-style awnings, and the owner has put into motion an effort to debut a 14-seat patio. Of course, that mission is also a culinary one. Chef de cuisine Bob Krajewski is putting the finishing touches on his overhauled menu. “There’s a beet salad we’ve been doing even before I started with [Aquitaine] five years ago. In an effort to update it—not modernize it; I don’t do modern food—we revised how the beets are cooked and cut, and we’re brightening it up with whipped bucherone, candied walnuts and baby watercress,” he says, as one example. 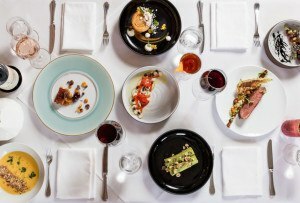 Other new dishes include mustard-braised rabbit ragu with gnocchi, seared scallops with shrimp dumplings and cauliflower mousseline, and duck l’orange with Seville oranges. Krajewski is also focusing on house-made charcuterie, including a classic foie gras torchon, duck rillettes, and garlic saucisson. 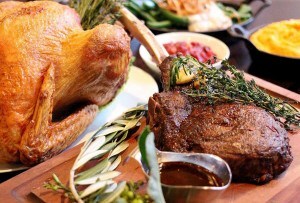 While his current priority is reintroducing Aquitaine to the Boston dining scene, he is also working on a new bar menu to soon go along with the updated cocktail area. Since debuting Aquitaine, Woods and partners Matthew Burns and Jeffrey Gates have expanded the brand into Chestnut Hill and Dedham. They also operate Metropolis, Woods’s first restaurant; Cinquecento, Gaslight Brasserie, and La Motta’s Italian Specialties. 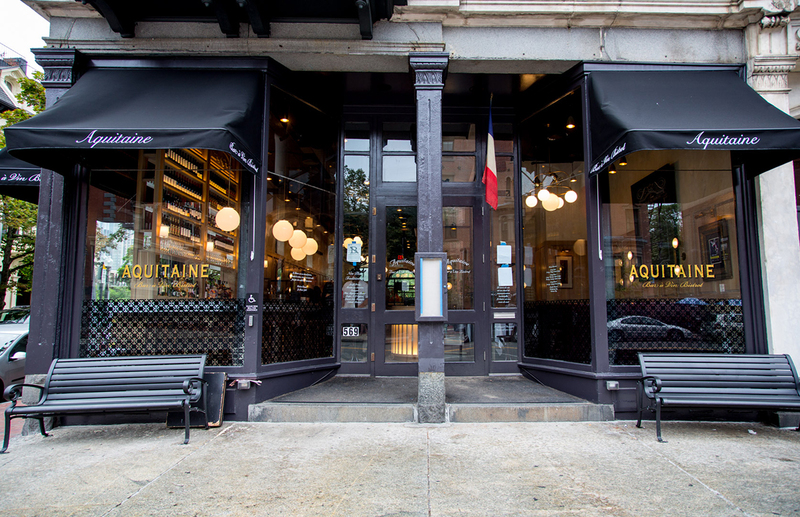 Aquitaine reopens on Tuesday, July 12—just in time to celebrate Bastille Day on Thursday, July 14. Lunch hours are Monday-Friday, 11:30 a.m.-3 p.m., and dinner runs Sunday-Wednesday from 5:30-10 p.m. and until 11 p.m. Thursday-Saturday. Saturday and Sunday brunch will kick off July 16, from 9 a.m.-3 p.m.
Aquitaine Boston, 569 Tremont St., South End, Boston, 617-424-8577, aquitaineboston.com.